All times UK. Fixtures are subject to change. T4F is not responsible for any changes that may be made. Both Manchester City and Arsenal's coaches, Pep Guardiola and Per Mertesacker are hoping to lead their teams to many wins. Both know that the secret to winning goes beyond just choosing a team of hunky, strong players - the entire game involves clever tactics and clever thinking. It involves each team analyzing the opposing team, watching the matches of the other team, scrutinizing the strategies and checking out the performance of its players. Arsenal and Manchester City are always closely matched in the Premier League title race and they're pretty much head to head. Manchester City Football Club was founded in 1880 and after starting off at Maine Road, they moved to the City of Manchester in 2003. The club was bought by Abu Dhabi United Group in 2008 and today is one of the wealthiest clubs in the world. With their home colours being sky blue and white, Manchester City's captain Vincent Kompany is regarded as one of the best central defenders in the world. Just recently the 30 year old has suffered a groin strain and couldn't complete the 2nd half of the game. Arsenal Football Club is based in London. The players train at the Shenley Training Centre in Hertfordshire and they also play in the Premier League. The club, at the end of the 20th century had won the highest average league positions. With the home colours having been bright red shirts with white sleeves, the team changes their home - and away colours often. Midfielder Mikel Arteta is Arsenal's club captain. He was made captain after Thomas Vermaelen's departure in 2014. He possesses superb leadership skills, but will it be enough to lead his team to victory? For Manchester City, with 2 Barclays Premier League titles as well as 2 domestic cup wins to their name in recent seasons as well as other top finishes, 2016/17 will see Manchester City challenge for trophies at home and Europe. But then again the success of Arsenal has also been laid at the feet of manager Frenchman Arsene Wenger with his new training regime. This has turned Arsenal into one of the strongest clubs in the Premier League. 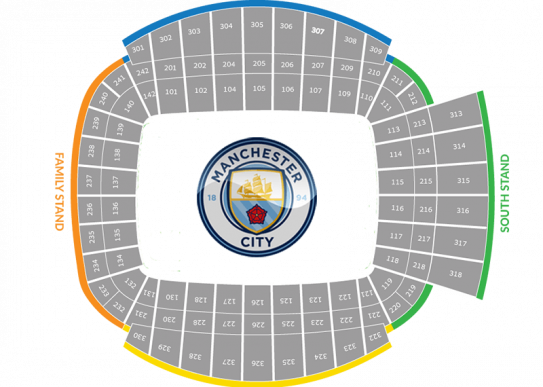 Buy your Manchester City/Arsenal tickets and watch the two teams play live. Watching games by these 2 teams is guaranteed to provide a few hours of riveting, world-class entertainment and atmosphere. Arsenal won the Premiership in 2003-2004 without losing one single match. Small wonder they have earned themselves the nickname 'The Invincibles'. Last season Arsenal finished 2nd in the Premiership table and qualifying for the 2016/2017 Champions League group stage. But then again, Mancity's Pep Guardiola is a man who is expected to deliver - to win titles, and with the Premier League being the most competitive league in Europe, all eyes will be on home to prove his worth and credentials in this coveted, tough league and his team is looking tough and maybe even dangerous.